The G.P.S. Rolling Range Bag incorporates the Visual ID Storage System. 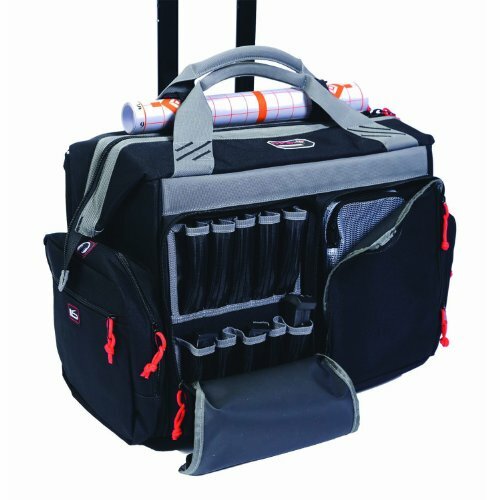 Components of this storage system include storage pockets that can be used to store Eye and Ear protection, Targets, Stapler, Tape, Binos, Tools, Cleaning Supplies, extra Magazines. The handgun holder allows the shooter to store two medium or small frame handguns inside the bag in a secure vertical storage format that allows better organization at the range. This Rolling Range Bag was constructed with the same strong materials used in making better grade luggage. A rigid internal frame with 6 metal rivets ensure it's long term durability.